The Annex Galleries is the representative of the Gustave Baumann estate. For the past 14 years, gallery director and co-owner Gala Chamberlain has been working on the catalogue raisonné of Baumann’s color woodcuts. She has gathered information on his early editions, books, unpublished works, and ephemera as well as related tales and anecdotes from his writing, friends, family, and collectors. Below is a brief biography of the prolific artist written by Chamberlain for the Annex Galleries, in anticipation of the impending publication. In 1891 a steamer delivered Gustave Baumann, his parents and his siblings to the U.S. They made their way from New York to Chicago to begin a new life. Baumann was ten years old at the time but manhood was just around the corner. With the departure of his father from the family, Baumann felt the responsibility of earning a living. With an ad in hand and drawings under his arm, he knocked on the doors of the commercial engraving houses in Chicago. He was hired as an apprentice and his career in art began. A good student and a quick learner, Baumann soon figured he could make more for himself if he opened his own business. Night classes at the Art Institute fueled his desire to go back to Europe for an education that would free him from the commercial grind. In 1904 he boarded a steamer for Germany where his year of study and travel stretched to eighteen months. He returned to Chicago in 1905 and soon after discovered Brown County, Indiana. Saving up $100. he could spend three months in Brown County, sketching and painting. 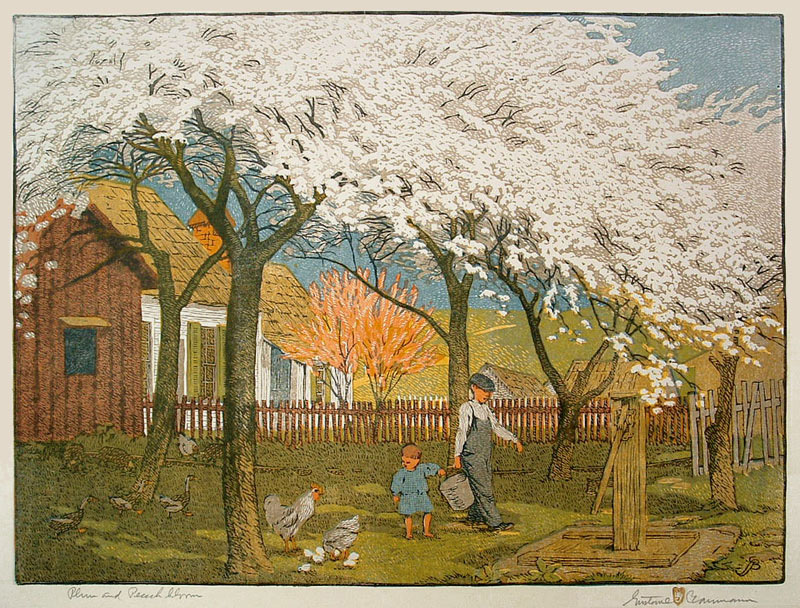 He produced a portfolio of small format color woodcuts entitled In the Hills of Brown and then produced some of the largest woodcuts at that time. 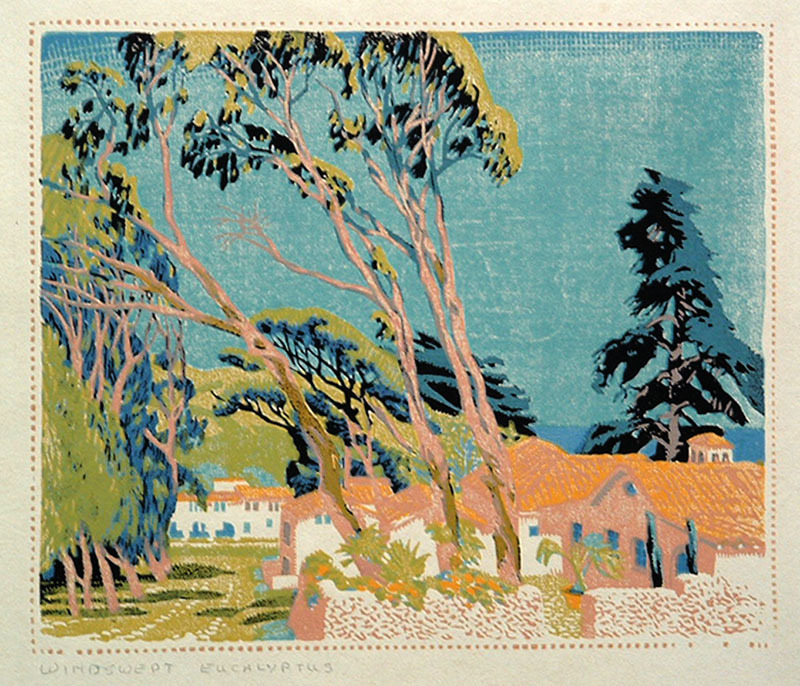 His work was selected for inclusion in the 1915 Panama Pacific Exposition where he won the Gold Medal for Color Woodcut. In the summer and fall of 1917, Baumann traveled to Wyoming, New York, Manhattan and Provincetown, MA. Many of his Chicago artist buddies had been to the southwest and regaled him with their stories of an exotic place named Taos. Baumann spent the summer of 1918 in Taos before visiting Santa Fe. Paul Walter, the director of the Museum of New Mexico, offered him a studio in the basement of the museum. His wanderlust was satisfied as apart from numerous sketching trips over the years he remained in Santa Fe until his death in 1971. During his ninety years, Baumann produced woodcuts, paintings, furniture, sculpture, toys and marionettes and wrote poetry and plays. Baumann was the ultimate craftsman, as he loved the feel of the wood, the tool and the handmade paper he selected. 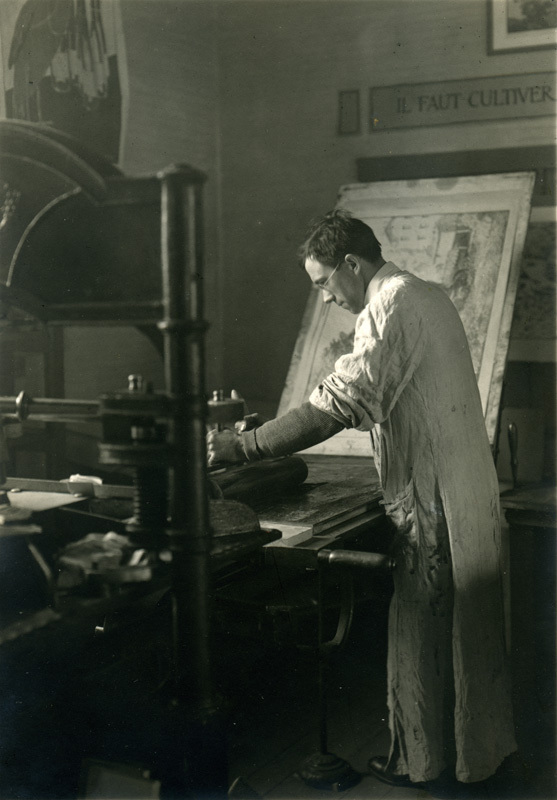 His hands controlled every aspect of his craft: the carving of the blocks, the mixing of the inks and the printing of the blocks. Baumann’s work is held in the permanent collections of numerous public collections and he actively exhibited his work throughout his life. 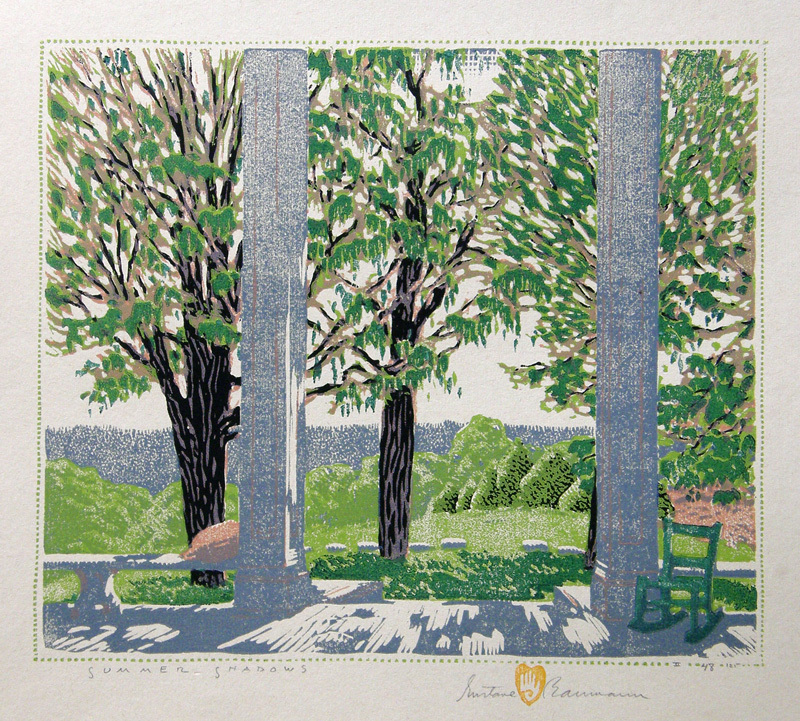 Be sure to see our full inventory of Gustave Baumann’s works. This entry was posted in Arts & Crafts, Biography, Color Woodcut, Exhibition and tagged arts & crafts, Brown County, color woodcut, Indiana, Nashville, Santa Fe, Taos. Bookmark the permalink. Sounds like the book is coming soon? I have just discovered after browsing here that I own an original Baumann! The woodcut is titled PALO VERDE AND OCOTILLO and is pencil signed and titled. Edition(ll 40 of 125); printed and published by the artist on cream quality wove paper. 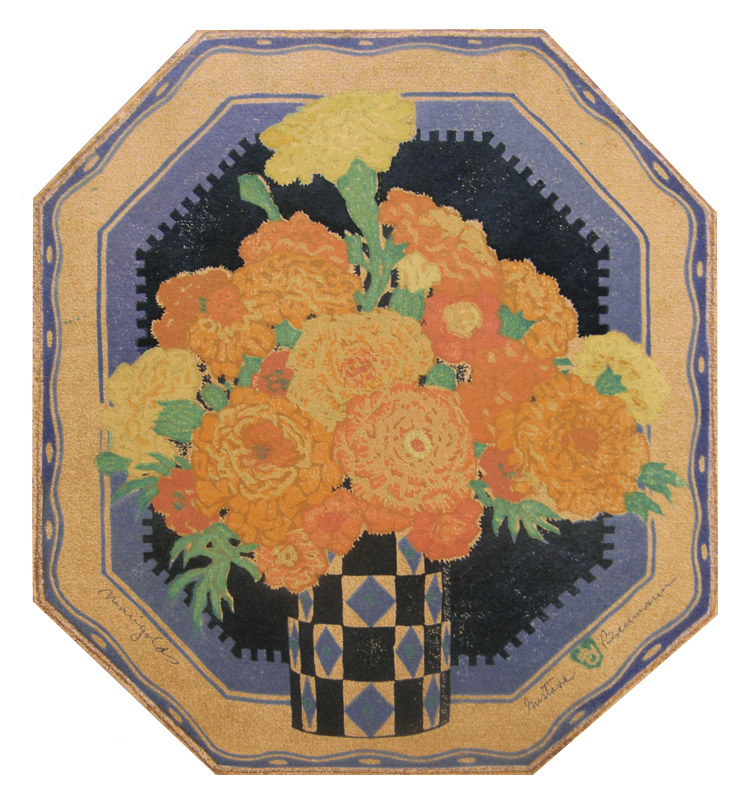 Paper size (19 half x 18″) approx. I have no idea at all of the value. Lilac Year and Sunny Messengers that the estate so generously gifted the gallery. They were spectacular! Thanks so much!